With spectacular views over the resort, the M Hotel Downtown By Millennium provides a welcoming atmosphere in the heart of exciting Dubai City. With a selection of modern rooms and suites, a fitness centre, swimming pool, and a variety of dining and drinks options available to guests, this fantastic 4-star property is a hot pick for families, couples and solo visitors alike. A short walk from famous tourist attractions including the Dubai Mall, Dubai Fountains and Burj Khalifa, the hotel is situated in a prime location for those that wish to explore Dubai. 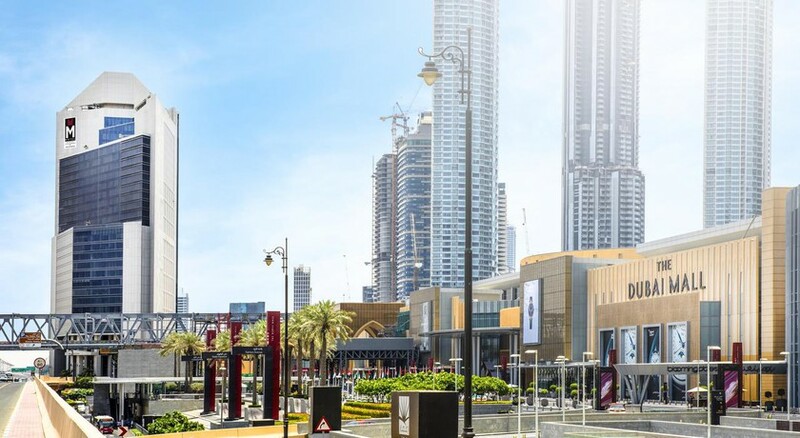 Other commercial areas are easily accessible from the hotel like Dubai World Trade Centre, Dubai International Financial Centre and Business Bay District. Lemon Pepper is the hotel’s chic international restaurant serving up buffet-style food all day, while the cosy pool bar and terrace lounge offers light snacks and bar food. M Hotel Downtown By Millennium is strategically situated in the heart of Dubai, making it convenient for both business and leisure travelers. It will be an exciting stay for beach lovers, too, as the famous Jumeirah Beach is only 10.6km away from the hotel. Those who want to satisfy their luxury shopping needs can hit the Dubai Mall, which is also a short 2.5km away. The Dubai International Airport is only 12.1km away from the hotel, making it convenient for the guests to board their flights on time. 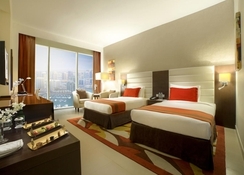 The rooms at the hotel are well-furnished, featuring modern decor, comfortable amenities and offer spectacular views of the resort's skyscrapers. The room types come in seven categories to meet the needs of solo travelers, couples, families and groups. 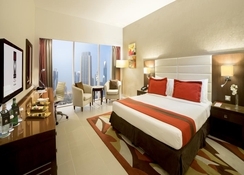 Choose from Standard Room, Business Class Room, Executive Room, Family Room, Corner Suite and One Bedroom Suite. They comprise all the necessary amenities for a modern-day traveler, including complementary WiFi, tea and coffee making facilities, hairdryer, in-room safe, mini bar, refrigerator, robes and slippers and toiletries. There are plenty of dining and drinking facilities in the four restaurants and bars of the hotel – each offering a different atmosphere. The La Terrasse Pool Deck is a sophisticated spot offering sweeping views of Dubai, ideal for a sundowner. Lemon Pepper is the hotel’s international restaurant serving daily buffet-style cuisine, while the Light House Terrace & Lounge is a spectacular spot for unwinding amid Dubai’s twinkling skyline. Shoko is the hotel’s in-house café, great if you need to grab a coffee on-the-go. There is a wealth of sports, entertainment and leisure facilities in and around the hotel to keep guests occupied. The fully-fledged fitness centre is great for those who wish to stay active on holiday. Or, the hotel swimming pool is a fantastic way to escape the heat – before relaxing at the Light House Terrace & Lounge with music and refreshments.